That sound you hear is the crackling of cash; of bank accounts getting fatter and fatter with the sales of young, white 20-30 somethings with fine pedigrees, some prodigies, and so few sans master degrees in today's global art market. Besides the financial benefits globalization has provided, it also has provided the side-effect of giving a voice to those who previously have been rarely heard. A fine example of art's power as cultural statement is currently on display at Jack Shainman Gallery. Curated by Nigerian-born artist Odili Donald Odita, this is truly one of the most heart-wrenching exhibits I could ever imagine. And given the fact that so much of the art world is too busy over the summer vacationing in the Hamptons, or checking out the corpulent mess that is the European biennials, here is a show that may go unnoticed. But in no uncertain terms should it be overlooked or missed-- this is the strongest work I have seen to date in 2007. Capitalism's reign over modern society has taken a chokehold, and left many by the wayside, especially the population of the African continent. With the timetable of Western colonization now going back through several centuries, our attention spans seem to be held for only so long; After all, there are only so many tales of starvation, of famine, genocide, female mutilation, cultural obliteration and religious manipulation that we can handle, right? Wrong. While the art world's own corporate profits continue their upward track, how many faces of color will be able to break through the color barrier to share in the profits? Not only is there a glass ceiling, but the current art collector or gallerist is far from color-blind. Just looking at the rosters of each of the top galleries, it's rare to see a face that looks physically different from the rest. Of course not only do top galleries ignore the work of artists of color, but there are few opportunities in many of these countries for those with artistic bents to be able to develop their talents, given the daily struggle for mere survival being a top priority. Taking this into account is an astonishingly harsh dose of reality by Dutch artist Christiaan Bastiaans, "Korper Zur Beobachtungsstation II," from 2004. As the conflict in Darfur continues to rage, we're faced with the doomsday scenario of an entire nation, as our leaders continually turn their backs to focus on more important issues-- 2008 campaign fundraising, or Paris Hilton's lack of underpants, for instance. This work by Bastiaans shows us that these victims are anonymous to us here in the west; a shroud covering them up-- the dirty, the unclean; they are modern lepers, if you will. It certainly is a difficult image to look at for too long, but this is reality at its most powerful. A society whose only guilt has been to find themselves in the wrong country at the wrong time in history-- a time of the Janjaweed running rampant, with a world willing to turn its back as the genocide continues to rage on. 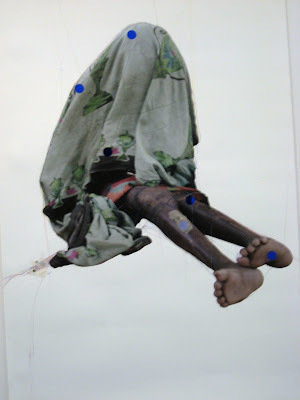 Another great work is at left by Surianmese-Dutch artist Remy Jungerman, "Nobody is Protected," from 2000. 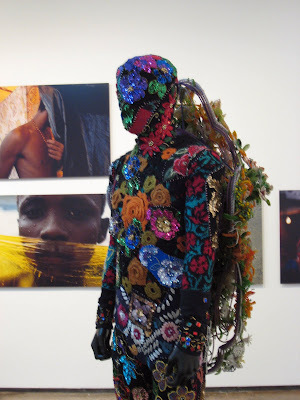 It focuses directly on world media, and individual cultures' interpretation of the message. Currently all the world is a stage-- here the setting is a press conference-- with a multitude of microphones awaiting a leader who perhaps is late, or unwilling to speak. The shoddy makeup of the wooden platform emphasizes our own questioning of society at hand. Will we continue to accept what images are thrown to us-- given the nature of pr's influence on our nightly news? 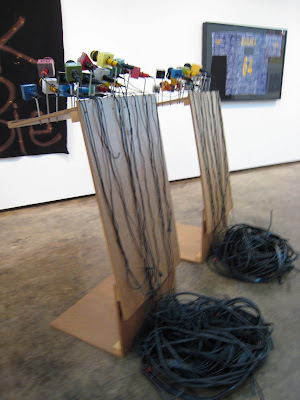 I like how the wires just lay in a pile at the front-- awaiting to be sorted out one by one. It's definitely speaking to methods of communication-- are they effective, and how does each society interpret their own "sources"? 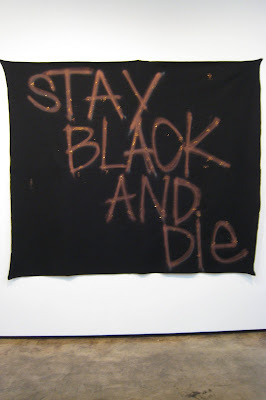 At right, "Stay Black and Die," from the series "Things I Need to do." Artist Rashid Johnson is posing quite an intense question-- Is being born black a death sentence? As AIDS continues to ravage a cash-strapped continent in desperate need of salvation, can identity of color literally mean a choice between life and death? Assimilate, and you will survive. Stay "black," and in this case, you will perish. Issues of race identity boil to the surface here. Is being what we commonly perceive as black merely a skin color, or a choice? Is Johnson commenting on the phenomenon of the Uncle Toms and Condoleezas of the world, if you will-- who become part of the white man's world, and achieve quote/unquote "success." Stay in the ghetto, and you shall die by the sword? A tough question, with no easy answers. The exhibit runs until August 3rd at 513 West 20th Street. I love the photograph in the first picture you show by Neto. The one with the yellow cellophane. It is one of my favorites from the show. If I have some more time, I might include a few more works from the show next week in a new posting.